Looking for stocks that are on sale? Then this trio of high-yield stocks should be on your watch list. Investing is easy: buy low and sell high! Yeah, right... If it were that easy, everyone would be a stock market genius, and that's just not how Wall Street works. It takes time, effort, and fortitude to make money in the market. And very often it requires going against the crowd. Which is why oil giant ExxonMobil (NYSE:XOM), real estate investment trust VEREIT (NYSE:VER), and packaged-food maker General Mills (NYSE:GIS) all look like bargains today. Here's what you need to know to see if they qualify as buys for your portfolio. One of Exxon's biggest troubles today is falling production. That's a key metric watched in the energy industry, and Exxon isn't putting in a good showing. Exxon's production declined 1% in 2016, 1.7% in 2017, and has declined through the first nine months of 2018. Management has a plan to fix the issue, but its goals look out to 2025. That's a long time to wait since many investors, particularly on the institutional side, think only quarter to quarter. This is why Exxon's yield, at 4.4%, is higher than it has been since the late 1990s. Its price to tangible book value, meanwhile, is lower than it has been since that decade as well. But Exxon is conservatively run and takes a long-term approach to just everything it does. That has left it out of step today, but with long-term debt at just 10% of the capital structure, it has the financial strength to see its growth plans through no matter what happens with oil prices (note that oil has fallen into another bear market recently). And, perhaps more important, Exxon's production rose sequentially between the second and third quarters as its U.S. shale drilling program started to bear fruit. That is just one of three levers it is pulling to get production growth back on track. It's also investing heavily in its downstream (refining and chemicals) operations. With a cheap price, a strong balance sheet, and its growth plans starting to show results, now is a good time for long-term investors to start looking at Exxon. If the energy giant's investment plans go as management projects, as they appear to be doing, short-term investors will start to catch on pretty soon. In a prior incarnation, VEREIT was focused on acquisition-fueled growth. As is often the case, it didn't end well. The company announced an accounting irregularity that led to a management shake-up, a dividend cut, and a revamp of the portfolio. That said, the new CEO, industry veteran Glenn Rufrano, has done an admirable job of putting VEREIT on a more constructive path. In fact, the company has managed to execute on each of Rufrano's targets. It has solidified the balance sheet, regaining investment-grade status. It has reworked the portfolio, culling out lesser assets and better diversifying by industry and lessee. And, most important for income investors, it has restored the dividend. The next big step is shifting back toward growth after years of portfolio pruning. That could be achieved this year, but it's more likely that 2019 will be the first year that VEREIT buys more assets than it sells. 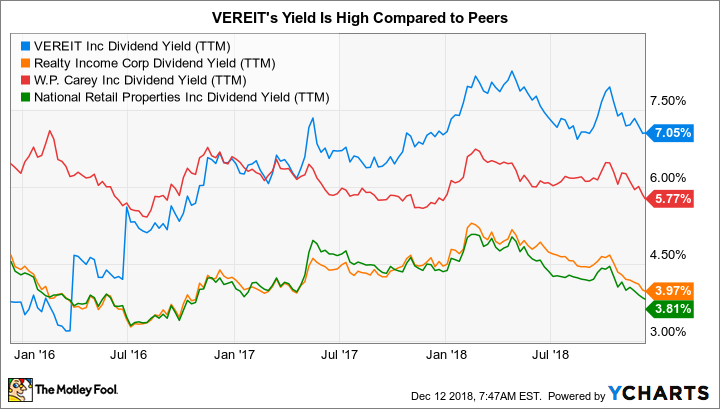 At this point, VEREIT is a financially strong and well-diversified REIT that just happens to yield materially more than most of its peers. The big 7% yield, meanwhile, is backed by adjusted funds from operations payout ratio that is very healthy at around 75%. The one issue holding the REIT's stock price back is the legal wrangling surrounding the accounting irregularity noted above. So far the REIT has paid $217.5 million to settle with owners of 31% of its shares. Using a little back-of-the-envelope math with those numbers, it looks like the damage is likely to be less than $1 billion. The company has ample liquidity to cover that cost. The legal issue is likely to hang over VEREIT for some time to come. But with a 7% yield, more aggressive income investors should be well rewarded for taking the risk. That's especially true now that the legal costs, which appear manageable, are starting come into focus. General Mills' dividend yield is a huge 5.2% today. That's roughly where it was during the deep 2007-2009 recession. Investors have simply punished the stock lately, with the shares down a massive 50% or so from their mid-2016 highs. There are a couple of big issues here. First, the packaged-food giant's portfolio is filled with brands that aren't resonating as well as they once did with consumers. Sure, Cheerios, Yoplait, and Betty Crocker, among many others, are iconic names in the retail space. But customers are trending towards fresher and healthier options these days. General Mills is shifting gears, via new versions of its old brands alongside acquisition opportunities, but it has been a slow process. That said, it gained share in eight of nine core categories in the fiscal first quarter of 2019, up from just two of nine in all of 2017. So it looks like things are moving in the right direction. The problem today is that General Mills just made a large, debt-financed acquisition. The purchase of healthy pet-food maker Blue Buffalo increased long-term debt by 60% year over year in the fiscal first quarter. Long-term debt now stands at around two-thirds of the capital structure. This is clearly a material issue for investors to think about. That said, the company covered its interest expense by 4.5 times in the quarter, so it can clearly handle the added burden. And management isn't ignorant to the issue, with plans to focus on debt reduction over the next few years (dividend growth is expected to be put on pause until leverage is down). 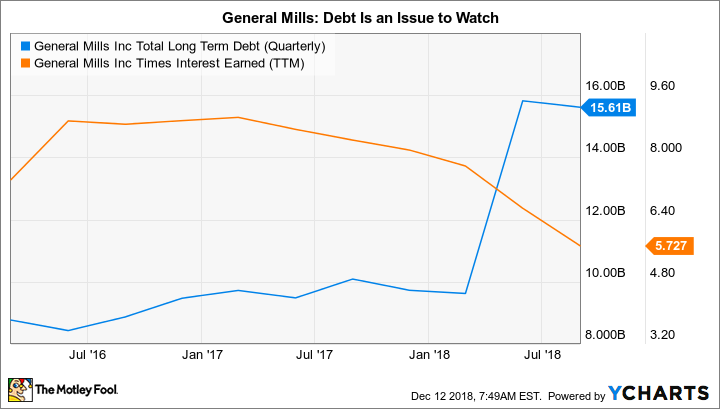 For investors willing to think long-term, the hefty yield offered by General Mills seems like a good risk-reward trade-off. The company has a more than 100-year history of adjusting to changing consumer habits. And while part of the shift this time around involves temporarily taking on a big chunk of debt, management is cognizant of the issue and doing something about it. The one thread that connects Exxon, VEREIT, and General Mills is time. They are all solid companies with some near-term headwinds that have short-term investors spooked. That's opened up an opportunity for those willing to focus on the long term. Exxon is by far the least risky of the trio, for those who prefer to play it safe. Because of the legal uncertainty, VEREIT probably tops General Mills on the risk front, so the real estate investment trust would be the most appropriate for aggressive types looking for a big yield. But all three are worth a deep dive if you are looking for bargain stocks today.